As I mentioned last week while sharing ideas on creating an outdoor oasis, we’ve been fast + furious over the past few weeks on sprucing up the outdoors of our humble abode. 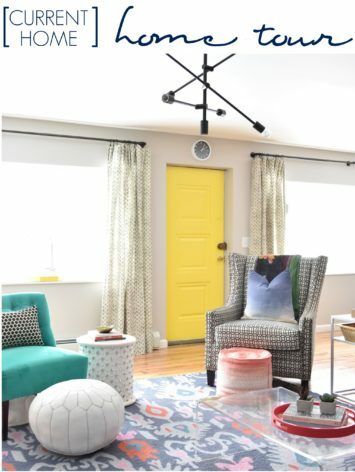 One of the many reasons I love having a blog is documenting the evolution of our home. 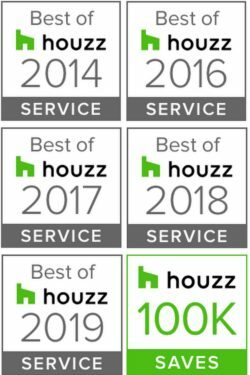 It’s wonderful to look back and see how much we’ve done! I found these edging stones at Lowe’s for $1.28 each. These stones are a trapezoid shape – about 7″ long on one side, about 5″ long on the other side. 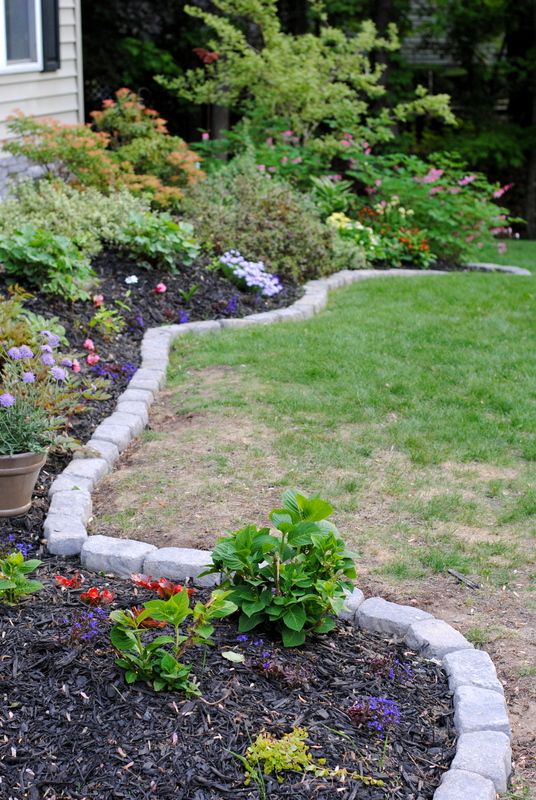 Because of the stones shape, they can be layed in a straight line (by changing the direction with each one) OR on a curve (tight curve or gradual curve) to border a garden. 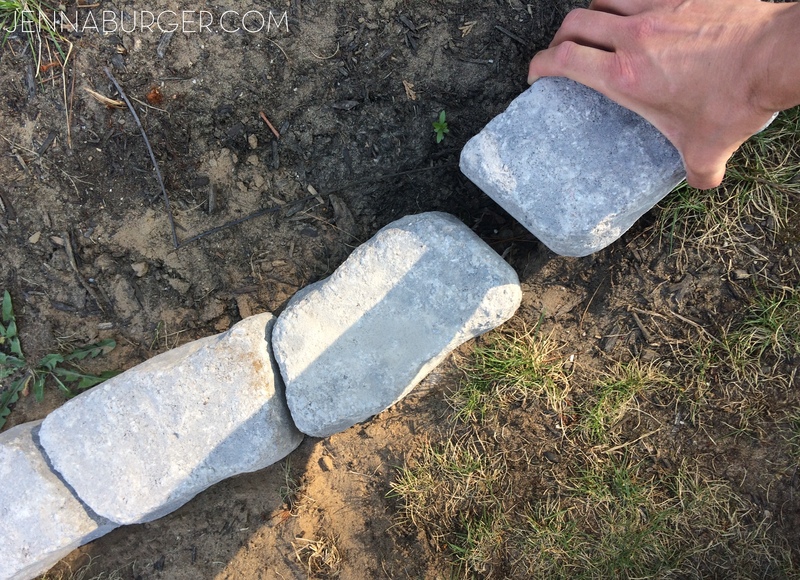 One row high is just enough (that’s what I did) or these inexpensive stones can be stacked (staggering the joint) to create a taller garden border or retaining wall. They can also be used to create a firepit. 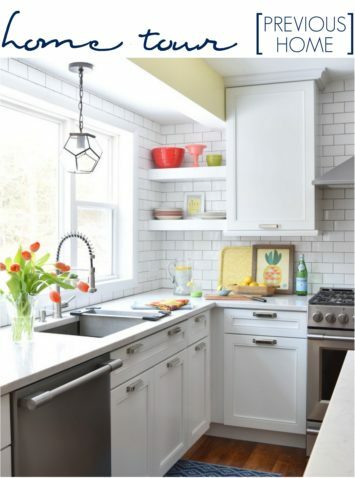 The best part about these stones aside from the price is that there is truly no installation! You simply set it & forget it (I sound like an infomercial, but it’s really that easy). 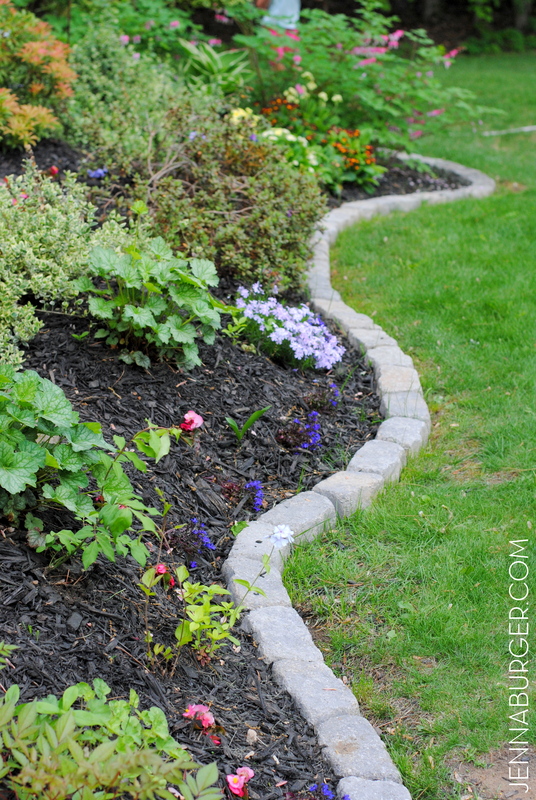 The garden beds bordering the front of the house & in the yard had a natural trench at the edge, so I followed the line and layed the stones in place. A few tweaks needed to be in some spots to create a nicer curve but in all it took minutes to lay them all. 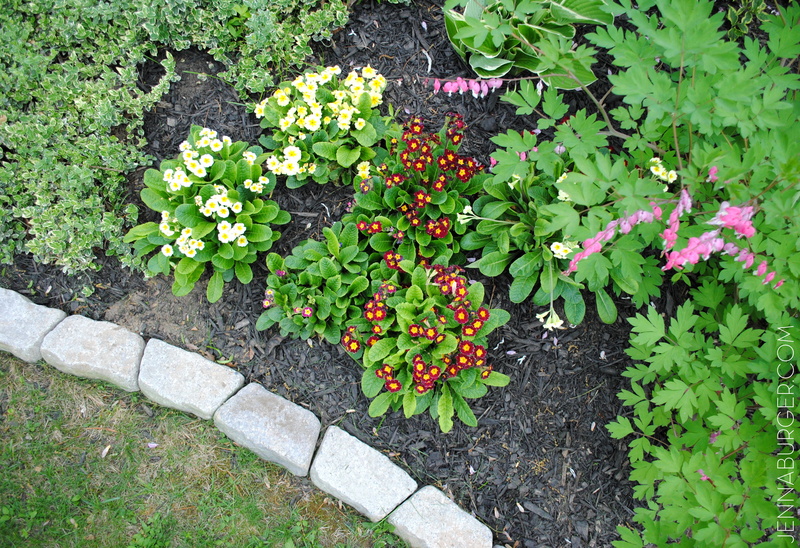 Once the stone edge was set, I planted a few annuals amongst the growing perennials and filled in the garden with mulch. It’s far from an award-winning garden, but it’s ours that we created. Each day the flowers show more of their beauty. I’ll admit, because I am a bit Type A & love instant gratification, gardening isn’t top on my list of favorite things to do. I often get frustrated & annoyed each Spring season not knowing what will bloom again. Thankfully looking back on old pictures, I am able to truly appreciate all the hard work we’ve put into creating a home we love. What an incredible lesson of patience, right?! 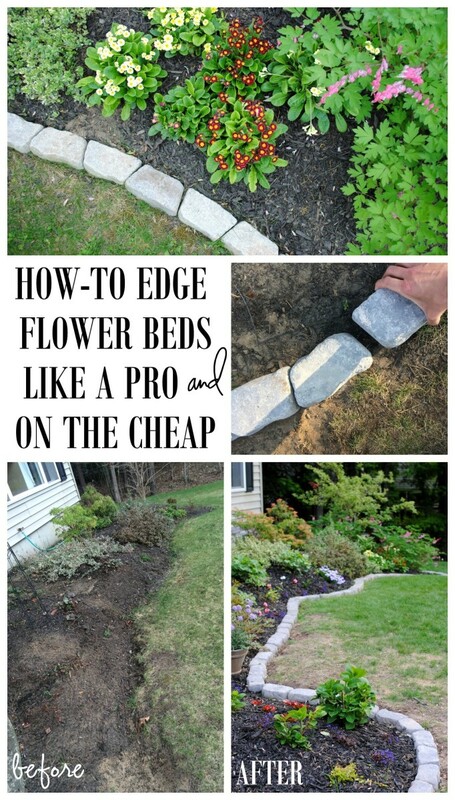 This stone edge was truly a simple + high impact DIY project to jazz up the front of our home. I am thrilled that it was inexpensive + easy to do – how much better does it get?! The front facade of our home also got another big upgrade. 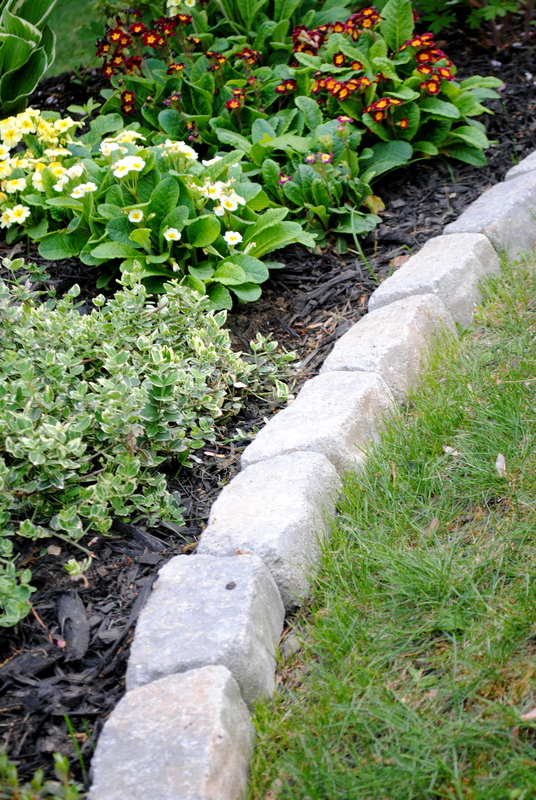 More on that coming soon… In the meantime, if you have garden beds that merge into the grass, adding a stone edge will surely create the definition needed to add character & texture to your landscaping beds! I just love your house Jenna and gardens look fantastic. Great job. It’s amazing what you can do with a little imagination and determination. Hi Jenna – I don’t see these stones at Lowes.com. Did you purchase them in the store? Yes, I did purchase them at the store, but in the post I shared a link. 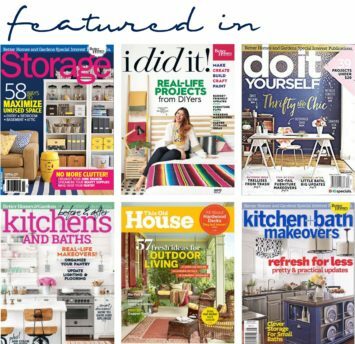 Your best bet though it to go to your local Lowe’s to see and purchase the material! I really like this border. Im glad you posted that I can buy these at Lowes. Hopefully they will have them again this year. Did they have them in different colors? They didn’t have different colors, but there were many options of sizes + shapes. Good Luck! Simply beautiful! 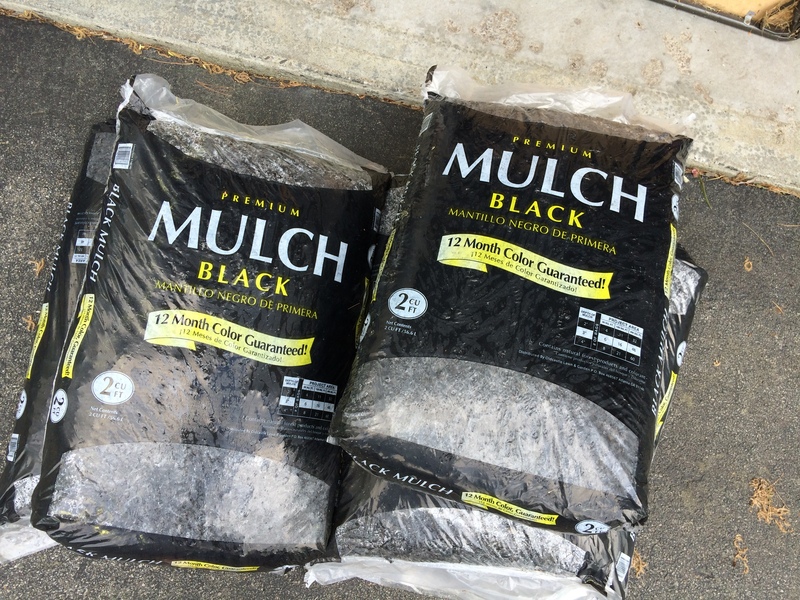 Recently purchased a house and almost fainted after getting an estimate from a landscaper. Decided to put on my DIY hat and let creativity flow. 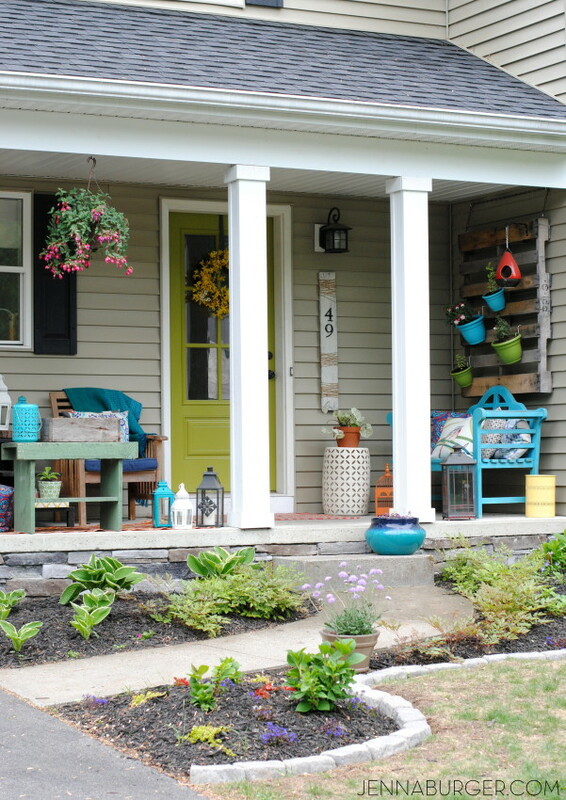 I love the columns added to the porch, were they DIY also? Thank you Melanie! Yes, the columns were a DIY project a few years back as well. Basically they were 4″ sq skinny columns before and we added 2 x 8 pressure treated lumber around them to give a beefy look. Then at the top and bottom, we had a simple trim surround. We were novice DIYers at the time, so it was a fairly easy project. Thinking about something similar for your home? Good Luck! I used pinecones. They are organic, free, subtle. 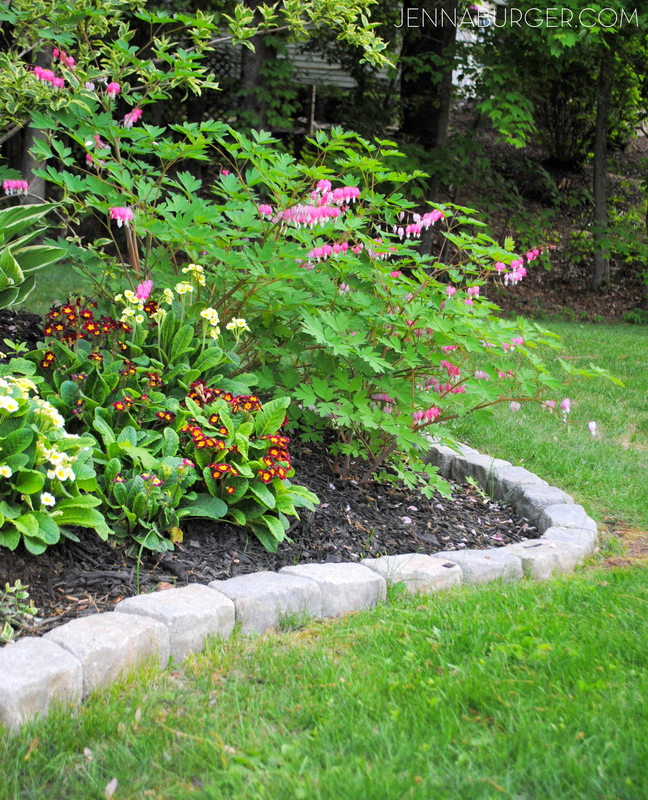 Defines the garden space and clears the property of fallen pinecones. Win-win! I would love to see pictures of this! Hi! 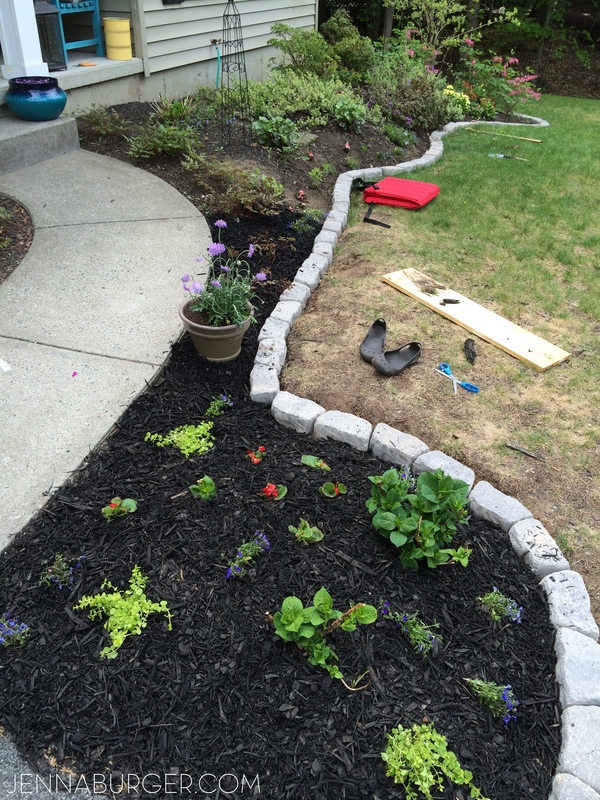 Thank you for taking the time to highlight this project – love the details! 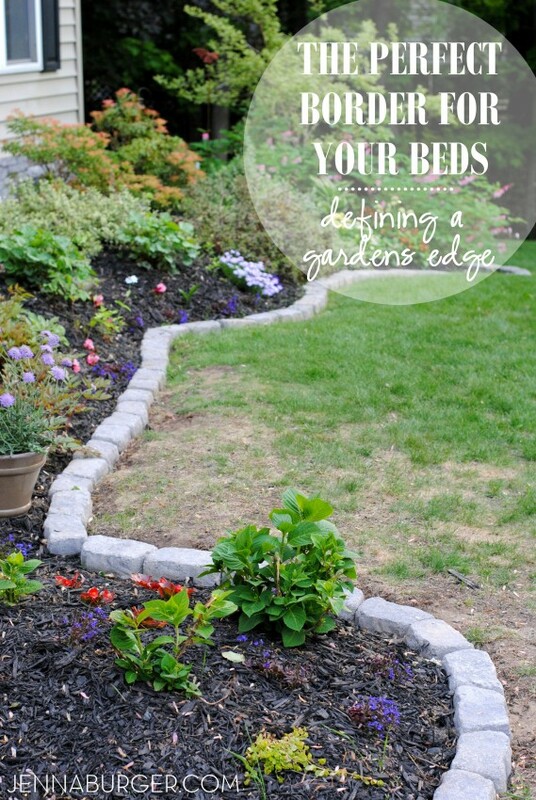 I’ve been slow to decide on edging for our landscaping and yours hits the mark perfectly. Sadly, Lowe’s in our area (Minneapolis) doesn’t seem to carry this edging in store, but I’m going to contact them directly to find out about delivery to us. I appreciate your efforts in sharing this design/products!